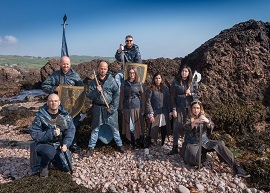 Top travel journalists and bloggers from GB are taking part in a Game of Thrones themed tour of Northern Ireland, this week. The group – whose publications and blogs have a combined audience of more than 1 million readers, or potential holidaymakers for Northern Ireland – was invited here by Tourism Ireland, in conjunction with Tourism NI. The journalists and bloggers enjoyed a trip along the Causeway Coastal Route, stopping off at various filming locations – including the caves at Cushendun (known as Stormlands in the TV series), the harbour at Ballintoy (Lordsport) and the Dark Hedges near Ballymoney (The Kingsroad). In Co Down, the group explored Tollymore Forest, where the opening scene of series one of Game of Thrones was filmed, as well as the Cistercian ruins at Inch Abbey (Robb Stark’s Camp). They also discovered ‘Winterfell’ at Castle Ward and Audley’s Castle and took part in a special Game of Thronesbanquet at The Cuan in Strangford. Julie Wakley, Tourism Ireland’s Head of Great Britain, said: “With the eighth and final season of Game of Thrones set to air over the coming days, Tourism Ireland is taking every opportunity to remind fans about the show’s connection to Northern Ireland. These GB journalists and influencers have a strong following, so their visit is a really good opportunity to showcase Northern Ireland to a wide audience of prospective holidaymakers. Their articles, posts and photos will be seen and shared by their readers and followers – inspiring them to come and explore the destination for themselves. Game of Thrones ‘fever’ is on the rise once again, with anticipation mounting among fans everywhere about the long-awaited eighth and final season, which is set to premiere over the coming days. Tourism Ireland will roll out a brand new campaign, showcasing Northern Ireland once again to millions ofGame of Thrones fans worldwide.